I missed Sunday night at the Festival because a friend I don't see often enough was in town. Big Mistake! Because I also missed the performance by Dante Sanchez and Angelica Avalos. 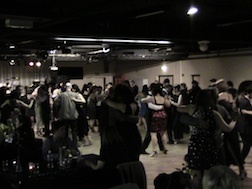 Since like most of my tango friends I didn't know them - I had no idea what I was missing until I watched a few Youtube videos. But fate has played into the hands of those Sydneysiders who like me missed out - because their Melbourne visit has been cancelled at the last minute and they are now staying in Sydney. They will be doing workshops with Mauricio of Ruedisima this Saturday in Newcastle and next weekend they will be doing workshops and performing around Sydney (details below. Here we are into our fifth day of the Sydney Salon Tango Festival - and I'm writing this for those who have missed out for one reason or another! It would take too long if I wrote about the classes - so I am concentrating on the milongas.